Every camper has at least one partner assigned to them. Some campers who may be more challenging to take care of physically or emotionally may have two partners. A partner is the most important and demanding of all jobs at camp. It is also the most rewarding. The goal of the partner is to make the camper’s experience a great experience. However, it is not the sole responsibility of the partner to achieve this goal. Every person who volunteers at camp is there to strengthen the relationship between a camper and his or her partner. 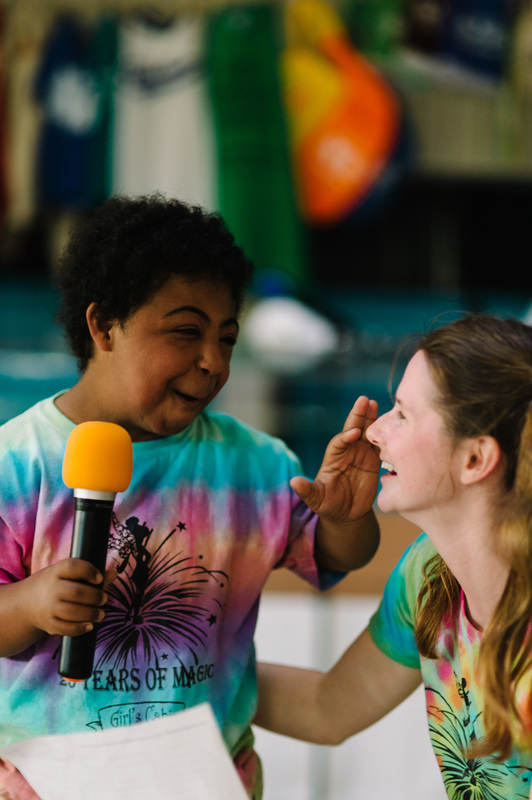 This requires that the partner communicate closely with the camper’s parents, cabin leaders, cabin respiratory therapists, cabin nurses, and the camp director to maximize the camp experience. We are all there for the campers and since you have the role as a partner, we are there for you too. A partner is with their camper all five days, all day long, functioning as a caregiver and friend. In many cases, lifelong relationships have developed. The partner’s day starts with getting their camper up, dressed and out of bed then heading off to breakfast. This means that you should plan to be dressed and ready to begin the day by 8:00 a.m. each morning. As a partner, you will accompany your camper to meals and activities during the day. At the end of the day, it is the partner’s responsibility, with help from the cabin leaders to put the camper to bed. Once the camper is set for the night the cabin leaders, cabin RN’s and cabin RT’s are there to take over for the rest of the night. Partners are then free to relax. All volunteers are required to stay on the camp grounds for the entire week of camp unless special arrangements are made with the director. - Having a background in health care for most, but not all, partners is important as healthcare needs during the day will be addressed by the partner. - Patience, patience and then some more patience! - A positive attitude and willingness to realize that the number one priority is assisting their camper to have the best week of the year..
- The ability to work well with others; teamwork is a must. - Be able to make a home visit prior to camp to meet your partner. Cabin leaders are the guts and glue that keep everyday activities happening. Cabin leaders must have previous experience at Trail’s Edge Camp. They are the biggest resource for new campers and their partners. Cabin leaders oversee the general health of all campers and monitor cabin interactions making sure that the volunteers and campers in the cabin are becoming a cohesive group and that no one feels left out. In addition, they provide care during the night. These dedicated individuals put all of their energy into ensuring that campers and volunteers have the best time ever. There are at least 10 cabin leaders in each cabin. These are your “go to” people whenever you have any questions, and when you need a break (and EVERYBODY needs a break). -Ability to remain calm during stressful times. -The ability to remember what it was like their first year at camp. there are many volunteers who are RNs and RTs professionally, there are two RNs and two RT’s designated to have these specific responsibilities. Each RN and RT is responsible for eight of the campers in each cabin. The nurse’s job is to make sure each camper receives all their scheduled and PRN medications throughout the day and night and to document their delivery. They are also responsible for monitoring overall health issues such as skin care, tube feedings, etc. The RTs are responsible for all respiratory care through the week, including inhalers, nebulizers, therapy vests, cough assist, ventilator and BiPAP checks and to ensure that all medical equipment is in order. They will document all respiratory treatments that are given. The cabin nurse and cabin RTs also cover night shift. If your camper is sick, these are the people you go to first. -The Cabin nurse must be a licensed or registered nurse. -The Cabin Respiratory therapist must be certified or registered and licensed. -Must have at least one year of camp experience as a partner. -Experience as a cabin leader in previous years is helpful but not required. the best week of the year. -High energy and the ability to stay calm in stressful situations. Activity staff are volunteers designated to plan and organize daily scheduled activities for campers and to provide supplies and ideas for fun things to do during free time. They begin working on camp months in advance and have the challenge of planning activities that will be suited for campers with a wide range of abilities and ages. They also have to plan for both indoor and outdoor activities due to the unpredictable weather during the first week of June. - Physical therapists, occupational therapists, speech therapists and recreational therapists are preferred but not required. - Must be VERY flexible and ready to change a plan in a matter of minutes. - Creativity is very helpful. - High energy with the ability to do a lot of walking. - The ability to work and stand for long hours. - A love (or at least a like) for washing dishes - we have lots of them after each meal. - And most of all the willingness to stand the heat ‘cause we’re cooking! All Volunteers need to be at least 18 years of age prior to the first day of camp.